Joseph Hoffman, our 6th bishop, passed away at age 76 on November 8, 1856. He was there at the beginning, growing up in the United Brethren church long before it officially organized as a denomination. He was licensed as a United Brethren minister in 1803, at age 23, and became a traveling preacher in Virginia, Maryland, and Pennsylvania. He could preach in both German and English. Hoffman was a bit out of step with his times, or visionary—or both—when it came to the minister’s role. Back then, as Thompson explained in “Our Bishops,” ministers were expected to preach without compensation on Sunday, and then ply their trade the rest of the week (most ministers were farmers). The belief was that only a person truly called by the Holy Spirit would do this for free. If ministers were paid fulltime, the role would attract persons who were in it for the money, not because they were called by God. Hoffman didn’t see it that way. He felt that if God called you to preach, that’s what you should do fulltime. Those who preached the Gospel should live off the Gospel. In that way, he was somewhat of a reformer. 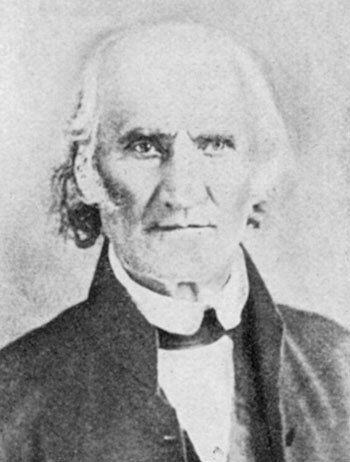 Hoffman was one of the three men ordained by William Otterbein in 1813, shortly before Otterbein’s death. The next year, he became pastor of the church in Baltimore which Otterbein had pastored for 39 years. He was 34 years old at the time, in his prime, but remained there just three years. In 1817, the Hoffman family moved to central Ohio, just southeast of Columbus—sparsely populated pioneer territory. His resume and experience immediately placed him in leadership among the United Brethren located there. His home remained there for the rest of his life. Andrew Zeller, also from Ohio, had been elected bishop in 1817, but poor health kept him from continuing in office. Instead, in 1821, Joseph Hoffman was elected bishop. Although he served only until 1825, he made the most of it, traveling extensively. He spent a summer preaching in Canada, and later spent a winter in New York City, where he preached in many prominent churches. Hoffman’s first wife died, and he remarried. Altogether, he fathered eleven children. Five of his eight sons became United Brethren ministers. On November 8, 1856, a new church was being dedicated near Lewisburg, Ohio. People were excited that Bishop Hoffman would be there to preach the first sermon. But he never made it. He died that morning before even leaving home.